PD: Mom Dead, Child Hurt in Wrong-Way Crash in Conn.
A 32-year-old Hartford woman is dead and seven people, including the woman’s 12-year-son, were injured after a 24-year-old Hartford man driving the wrong way ran a red light in Hartford Thursday night and caused a four-vehicle crash, according to Hartford police. Hartford Police Deputy Chief Brian Foley said officers conducting DUI enforcement heard the crash at the intersection of Barbour and Westland streets around 8 p.m. 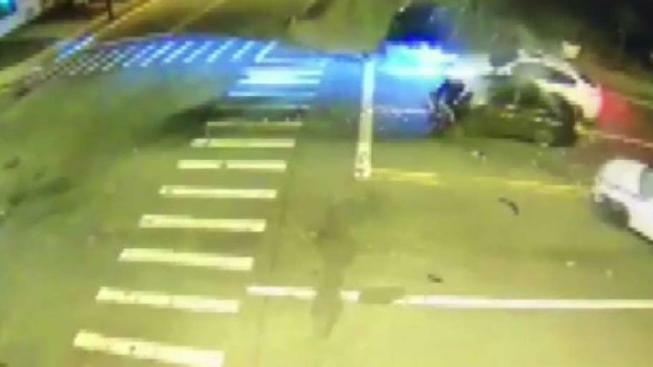 According to police, 24-year-old Patrick Milner was driving erratically and speeding the wrong way through the intersection, drove around several vehicles and went through a red light before colliding head-on with another car in a crash that was captured on camera. Deidre Gray, 32, of Hartford, was rushed to Saint Francis Hospital, where she was pronounced dead, police said. Her 12-year-old son suffered some minor injuries and is with family. Foley said Milner is a convicted felon known to police. He was found with a .40 caliber Glock that was stolen from Boothbay Street on Jan. 20, according to police. He also had a magazine that contained nine rounds, heroin and marijuana. “This is a convicted felon. He’s known to police. He had a stolen gun on him tonight and narcotics and we haven’t even searched the car yet. So there could be more to this than we know at this point," Foley said. Milner served a year in prison on a gun conviction in October 2016, according to police. He has been charged with carrying a pistol without a permit, weapons in a motor vehicle, criminal possession of a firearm, stealing a firearm and possession of narcotics. Police expect further charges in connection with the crash.